Doozer got first place in the the Wiskers on Wednesday costume contest! 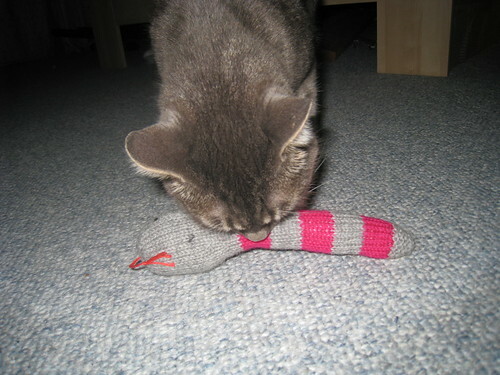 His prize arrived in the mail today–a hand knit snakey! Isn’t it sweet? Thanks Jess and Monica! Also, my TAS and I are doing a word war. Last one to get to 25K words has to buy the other one some chocolate and it has to be done by Sunday at bedtime. I’m off to NaNo land. :-) Wish me luck!